A recent Forrester report on the state of agile development exposes the difficulties in agile adoption. 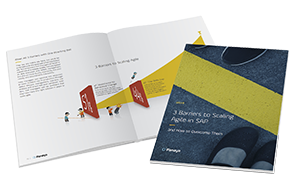 Only 20% of enterprises have been able to apply agile methodologies to their entire application lifecycle. Three roadblocks are currently hindering SAP application managers’ efforts in scaling their agile methodologies. Read this eBook and learn how to overcome them.